Waterwise responded to a select group of WRMPs to help raise ambition on water efficiency. We will be holding a Supporter Only event and launching a report on water efficiency in WRMP19 later in 2018. 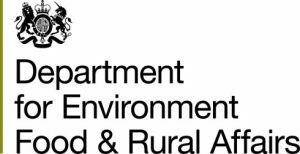 The Department for Environment, Food and Rural Affairs (Defra) commissioned Collingwood Environmental Planning (CEP) through the Centre for Ecology & Hydrology (CEH) to carry out a rapid evidence assessment (REA) of existing academic and other literature about behaviour change approaches to reducing household demand for water. What behaviour change approaches have been used to reduce household demand for water and how effective are these approaches? What key evidence gaps remain in the evidence base and how best could these be filled? Water companies have a legal duty to promote efficient water use. 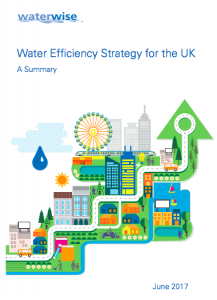 The main focus for domestic water efficiency programmes or interventions in the UK has been on reducing the amount of water from the public water supply that is used in the home. Behaviour change approaches address an aspect of water demand that is not amenable to engineering, technological or regulatory interventions (Hoolohan, 2015). Common to all behaviour change approaches is an understanding of individual behaviours as open to influence, that is, not fully determined by factors such as engrained cultural habits or technological systems. 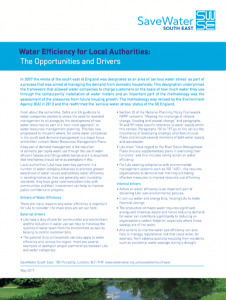 A toolkit to support local authorities and housing associations to work in partnership with water companies to deliver water efficiency. This includes an overview of drivers, an overview of partnership water companies and a range of practical case studies and examples. 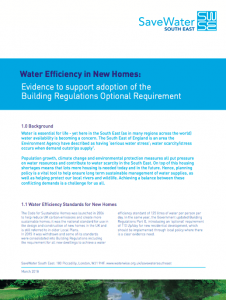 This guidance was developed by SaveWater South East to provide evidence in support of local authorities choosing the optional requirement of a 110 litres per person per day water consumption target in new homes. Water efficiency services represent a key benefit from the introduction of retail competition to 1.2 million businesses, charities and public sector organisations in England from April 2017. This research was undertaken from the customer perspective to identify what level of water efficiency services are being offered by new retail water companies.It was undertaken between 13 and 21 November 2017.